Sagamore Hill Stables is a full-service boarding, training and show barn. Our main focus is helping our riders to accomplish personal goals while offering a high level of care for the horses. Our program teaches riders of all abilities and ages with a focus towards the show ring. Our facility is located on 20 picturesque acres in Huntington, New York. This location allows us to service customers in Brooklyn, Queens, Manhattan, Nassau County and Suffolk County. We are located at Stanhope Stables in Huntington, NY. Our facilities include spacious stalls with indoor and outdoor wash stalls. 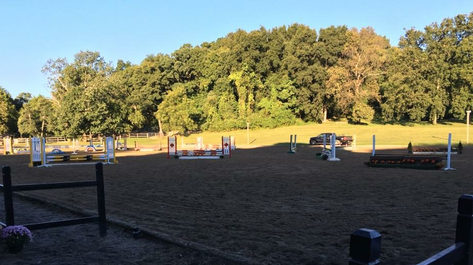 We have numerous turnout paddocks, an indoor riding arena, grand prix jumping arena, pony ring, dressage ring, exercise track and miles of trails in West Hills County Park. The footing in all rings is maintained twice daily to ensure the safety and health of our horses and riders. Stanhope Stables offers over 50 turnout paddocks both sand and grass to ensure your horses happiness. All horses are turned out a minimum of 4 hours per day. 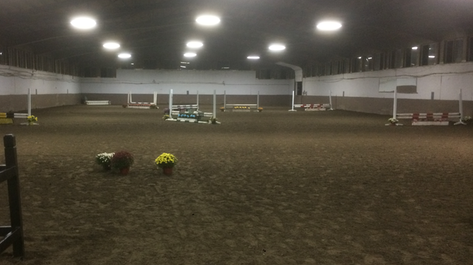 Main barn offers twenty five 12x12 and 10x12 stalls with Yoke Gates. Most stalls have a window and mounted fans for your horses comfort.